Members of the JJC choirs sing during the event. 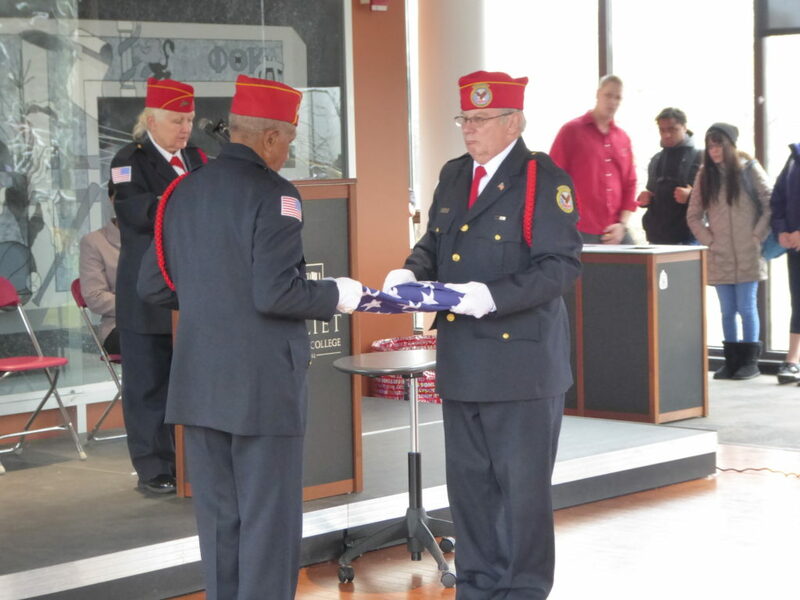 Local veterans display the nation’s colors. Local veterans during the memorial service folding the American flag. Photos courtesy of Pam Dilday. 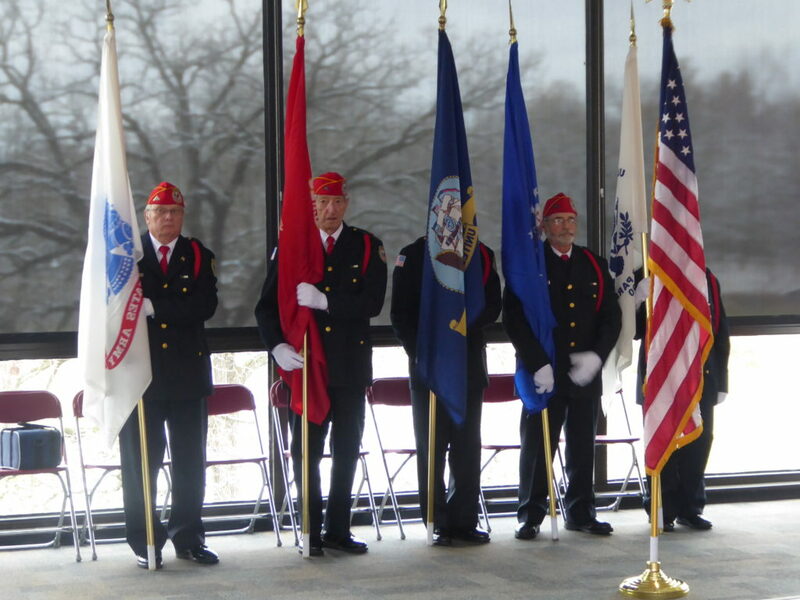 The Joliet Junior College Office of Student Activities (OSA) hosted the annual Veterans Day Ceremony on Friday, Nov. 9. The event began at noon on the Veterans Memorial Bridge at Main Campus. It was free and open to the public. 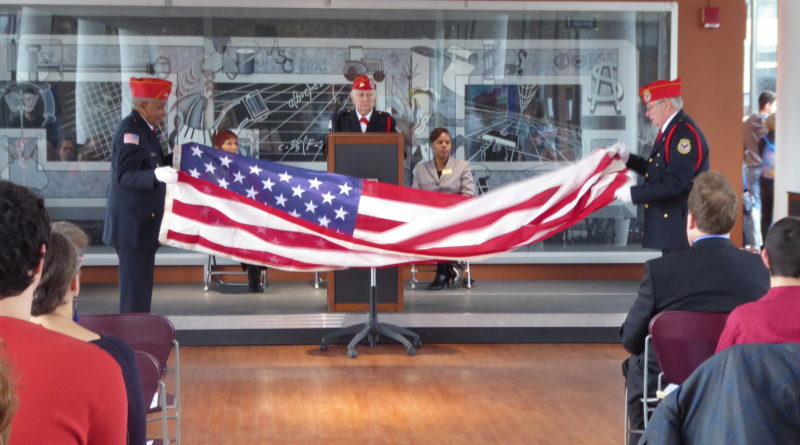 JJC has conducted a Veteran’s Day Ceremony for more than 10 years and this year was no different. The public was invited once again to join JJC employees and students in honoring past and present veterans. Light refreshments were provided to all attendees including students and staff walking by. The lovely smell of popcorn filled the halls, so if students were not aware of the event, they were soon to find out. The occasion signifies a lot for JJC’s history, so to show the importance of the matter, JJC’s very own President Dr. Judy Mitchell provided the welcome address which was followed by the posting of the colors, pledge of allegiance and National Anthem. 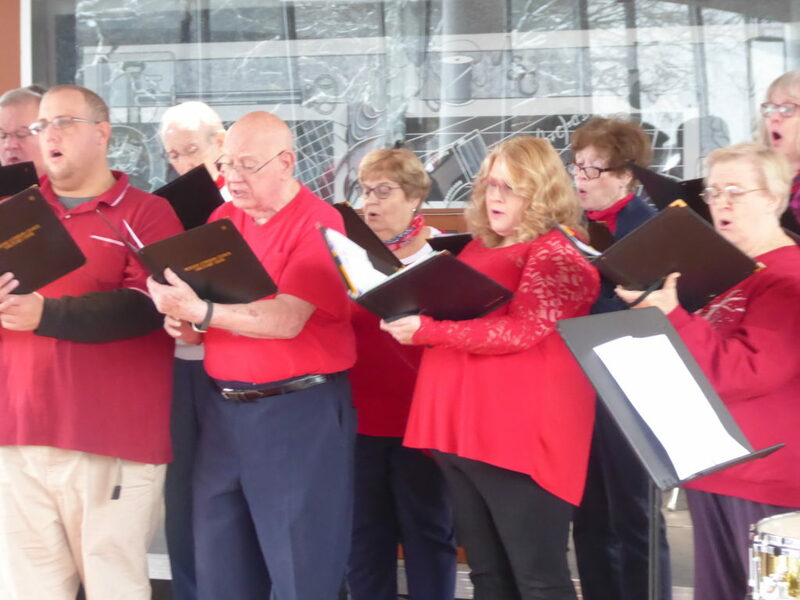 The ceremony also included a moment of silence, a flag folding demonstration, recognition of military veterans by branch, and a performance by the JJC Chamber Singers and JJC Chorale. This was not JJC’s first time hosting an event to honor and pay tribute to the soldiers and their families for fighting for our country, risking their lives, and keeping us safe. Special thanks were giving out as the attendees got to know one another. The vets that attended were having a marvelous time, but not because of what was said, but for how is was orchestrated, its purpose, and the ideal that America has not forgotten them and what they fought for. All veterans that attended wanted was to feel appreciated and recognized for their journey. Some members stated that they thought this new generation has lost touch with the vets, but that JJC are constantly proven them otherwise and making them proud. What made this event different from all the other events that they had attended was the amount of non-vets who attended and showed their support. The whole feel of the event was something to dawn on for years to come, with the uplifting sounds of the music, smiles on many of the attendee’s faces, and the history behind the event that caused everyone to take the time to come together and ravel in the beauty of togetherness, unitedly as one. This was an event many people had looked forward to and cannot wait until next year to do it all over again.